I prefer staying in the central Arkansas areas within a 50 mile radius.. I have been known to drive much further if someone cannot find help elsewhere. Lakes. yards, parks and anywhere I can be of assistance to help you find what you thought was lost forever. 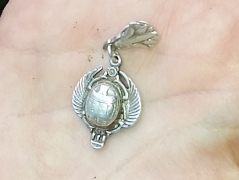 I am 42 and I used to go out detecting with my father when I was four years old, so I’ve hunted for treasures most of my life. I purchased my first metal detector in 2001, but I didn’t get serious until 2012. I usually detect 1-3 times per week. I use a Minelab CTX 3030, XP Deus and White’s Matrix M6 as my primary machines. I have others as well. I primarily “coin shoot” as a hobby, but I also look for Civil War relics. I have detected battlefield sites for museums and donated items to many historical societies in Arkansas. I have also found jewelry for tornado victims after their homes were destroyed. What motivated me mostly about being a “Ring Finder” was that back in 2005 my now deceased wife lost her wedding set in the yard. I had only a cheap detector and I didn’t really know what I was doing. I never found the ring and I hope that I can help others to not have to go through the pain of losing something they cherish. I only wished I had someone to help me back then. My goal is to help others above all else. "I will never forget the sinking feeling that overwhelmed me when I realized my necklace was missing. It was the morning after I attended the first of our local zoo's Halloween events they have throughout October. I w/,as getting ready the next day when I noticed it. The necklace was not worth a fortune, but it was irreplaceable. It was from the 1920's, an era I am fascinated by, and was a gift that both my husband and sister had chipped in to buy me. I wore it every day, and it had become such a part of me that I didn't think twice about wearing it that night. To put it lightly, when I realized it was missing I absolutely panicked. I searched through all the pictures we had taken that night and looked at the times the pictures were taken to narrow down where I lost it at. I soon realized that I probably lost it in a massive inflatable obstacle course. My husband and I sped to the zoo, but the obstacle course was deflated until the next event that night. We searched the grass and the area all around the obstacle course with no luck. I was devastated. We talked to a friend who worked at the zoo, and he told us he would check in the obstacle course again when they inflated it that night. He didn't have any luck either, and I felt completely hopeless. I had spread the word about my missing necklace on Facebook, Craigslist, and had even put an ad in the newspaper. My parents suggested I contact somebody local with a metal detector, and that is how I found John May. He was prompt in replying to me, professional, friendly, and was very willing to help. It took time to get the zoo's approval to bring a metal detector in, but finally we coordinated everything and arranged a meeting time that was 12 days after my necklace went missing. My hopes were slim since the zoo had been especially busy during this time due to their Halloween events, but I tried my hardest to remain optimistic. When I met John at the zoo, he was absolutely incredible. He told me all about his experience and his metal detector. He had even helped tornado victims find their missing jewelry. I knew if anybody could find my necklace, he could. He talked us through everything throughout his search, which was so reassuring (he found a metal pipe in the ground and lots of coins). After 45 minutes of relentless searching, he found my necklace in the obstacle course itself. I was beside myself with excitement, and still am two weeks later. I cannot say enough positive things about my experience with The Ring Finders, and especially with John May. He is kind, talented, and selfless in every sense of the word, and it was truly an experience I will always remember fondly. I told my husband as we got in our car that he was a superhero, and I am even convinced that is an understatement. Thank you again John, for all you did for me!"